We love the temperature contrast in this super simple pasta recipe; serve it quickly so the contrast remains. And you must make this in the summer with garden fresh tomatoes and freshly picked basil. It just won't be as good in the winter, with tomatoes that are lacking flavor and have a wooly texture. If you don't have tomatoes growing in your garden, get them at a farmer's market. The tomatoes should be firm and heavy, with no soft spots and a thin skin. You can tell if the skin is thin by running your fingers over the surface. A thin skin will feel delicate and smooth. If you can find some freshly made pasta for making this recipe, all the better. The olive oil should be the really good stuff, and the lemon juice must be fresh. And make sure that the Parmesan cheese is freshly grated. The Parmesan needs to melt together with the other ingredients. With ingredients that fresh and good, you only need a few to make a great meal. Serve this perfect mid-summer dish with some hot and crisp toasted garlic bread and a green salad tossed with some sliced mushrooms or maybe some cubed ripe avocados. For dessert, a cool and creamy flavorful ice cream pie or little tartlets would be just the thing. Most recipes for this type of pasta don't add cheese, but just a little bit really brings the flavors together. And don't omit the lemon juice. You don't really know it's there; it just brightens up all the flavors. Use the leftovers (if any) to make tomato pasta frittata. Yum. Prepare tomatoes, place in a large bowl, and add the olive oil, lemon juice, basil, and salt and pepper to taste; mix gently and set aside to marinate. Bring a large pot of salted water to a fast boil and add spaghetti; cook until al dente according to package directions, about 7 to 8 minutes. 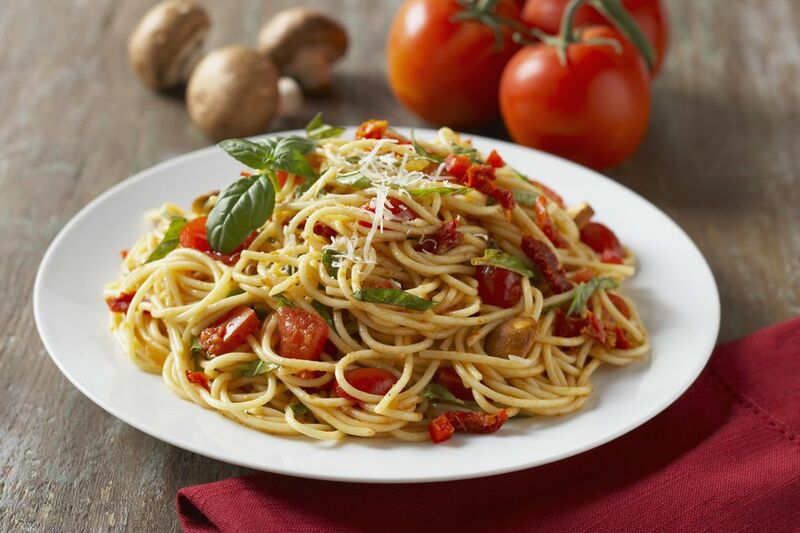 Drain the pasta and immediately toss with tomato mixture in the bowl; serve at once, sprinkled with the cheese.